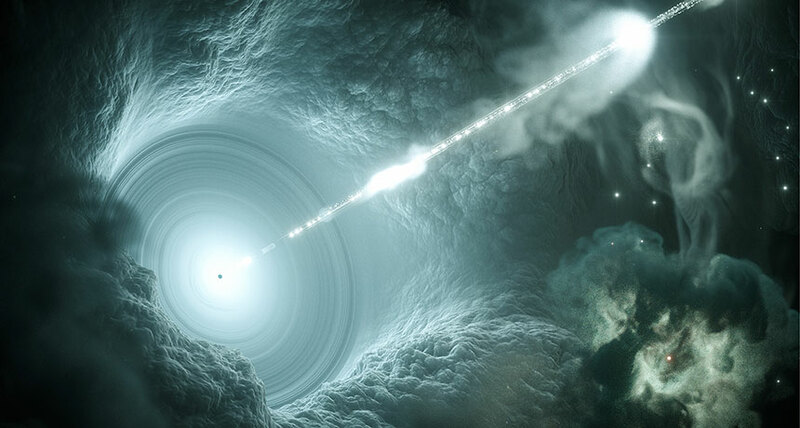 HOME BASE Scientists traced a high-energy neutrino back to its source: a blazar, a galaxy harboring a supermassive black hole that fuels powerful jets of particles. A zippy little particle has been traced back to its cosmic stomping grounds, a flaring galaxy 4 billion light-years away, for the first time solving a cosmic whodunit. Scientists have long puzzled over the sources of high-energy particles from space, which batter the Earth at energies that can outstrip the world’s most advanced particle accelerators. Now, physicists have identified the source of an energetic, lightweight particle called a neutrino. The intergalactic voyager came from a type of bright galaxy called a blazar located in the direction of the constellation Orion, scientists report online July 12 in Science. “This is super exciting news,” says astrophysicist Angela Olinto of the University of Chicago, who was not involved with the new result. “It’s marking the beginning of what we call neutrino astronomy,” which uses the nearly massless particles to reveal secrets of cosmic oddities like blazars. While there may be additional cosmic sources for high-energy neutrinos, the detection indicates that at least some come from blazars. The result also suggests that blazars emit other energetic particles known as cosmic rays, which are produced in tandem with neutrinos. The origins of high-energy cosmic rays are poorly understood and until now, “nobody has ever been able to pinpoint a source that produces them,” says astrophysicist Francis Halzen of the University of Wisconsin–Madison, a leader of IceCube, the Antarctic neutrino observatory that detected the particle. Thanks to this discovery, “we will better understand nature of the universe’s immense cosmic accelerators,” France Córdova said in a July 12 news conference in Alexandria, Va. Scientists can’t produce such high-energy particles on Earth, “so we have to turn to the heavens to deepen our understanding of the highest-energy processes,” said Córdova, the director of the National Science Foundation, which funded IceCube. IceCube, which was constructed within a cubic kilometer of ice sheet, uses thousands of embedded sensors to measure light produced when neutrinos slam into the ice. On September 22, 2017, IceCube detected a neutrino with an energy of nearly 300 trillion electron volts. (For comparison, protons in the Large Hadron Collider in Geneva reach energies of 6.5 trillion electron volts. By tracing the neutrino’s track backward, scientists zeroed in on a region of sky in the direction of the constellation Orion. Astronomers leapt into action, and telescopes around the world scoured the spot for light that could reveal the particle’s source. A flare of gamma rays, a type of high-energy light, was detected by the Fermi Gamma-ray Space Telescope coming from a blazar called TXS 0506+056, a brilliant galaxy powered by an enormous black hole that launches a jet of energetic particles in the direction of Earth. A variety of telescopes observed the blazar’s flare in other types of light, including X-rays and radio waves.